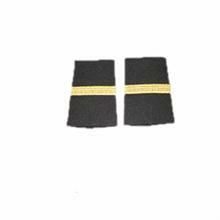 Add that final touch of professionalism with shoulder insignia designed to slip over the shoulder epaulets of our Pilot Shirt. Choose gold or silver metallic stripes on a black background. Specify number of stripes (1,2,3,4) as well as stripe color (gold or silver). Or, choose solid color insignia in black, grey or red (without stripes).